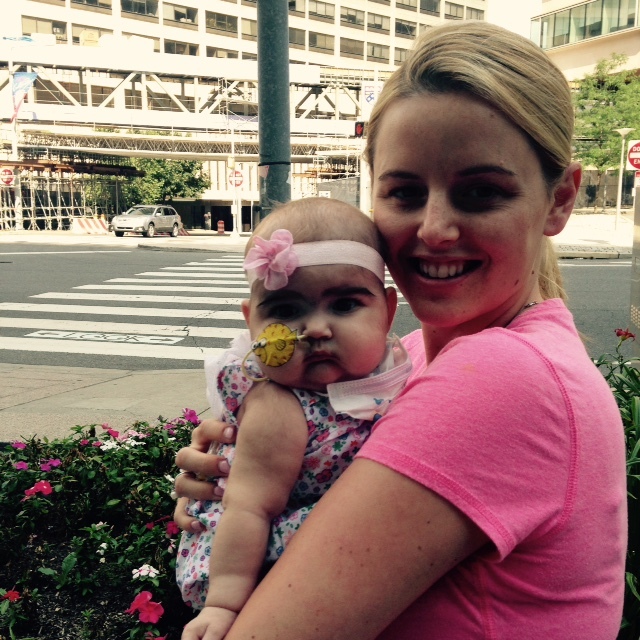 At 6 months old Olivia had spent most of her life in the hospital. But this day was a day to celebrate as she was well enough to go outside for the first time in 4 months! The following was written by Jill DiStefano, Olivia’s mom. Olivia was the 4th person diagnosed with NLRC4 macrophage activation-like syndrome (NLRC4-MAS), a type of periodic fever syndrome. 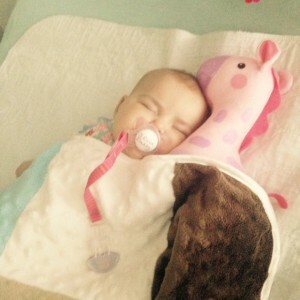 This is Olivia’s story and how we came to find out about her NLRC4 mutation. Olivia is only the 4th person to be diagnosed with NLRC4-MAS, and there is still much to learn. I wanted to share her story, in the hope that it will help others to get diagnosed and start treatment as soon as possible. Olivia was born on January 26, 2015, two days before her due date. It was an uncomplicated delivery and she had a healthy weight at 7 lbs. She was “healthy” until approximately seven weeks old, when I noticed she started coughing and had occasional sneezing, but I just thought she was coming down with a cold. At 7 weeks old Olivia developed a fever and rash that was diagnosed as parainfluenza, but the fever never went away and the rashes kept returning. At 7 weeks old she was diagnosed with parainfluenza. On March 20, 2015, after her night time bath I noticed a rash on her chest–it reminded me of roseola, but she did not have a fever and appeared well. The next day, on the 21st of March she woke up from her afternoon nap with a high fever of about 103º F. I took her to the emergency room and she received the standard “fever work-up.” She still had the rash on her chest. She was congested and coughing and they suspected something respiratory. Her white count was normal, and the chest x-ray also looked fine. Her urine test was also negative for infection. Of note, the ED physician did state that her spleen felt a little enlarged, and ordered an ultrasound. We were told that her spleen was “mildly enlarged,” but that it was “nothing too concerning” and that with viruses, the spleen can get enlarged. Also, her AST and ALT liver enzymes were “slightly elevated,” but again, nothing off the charts. We were sent home with the diagnosis of bronchiolitis/croup. The ED called the next day to let us know that her respiratory panel was positive for parainfluenza (a virus that can cause bronchiolitis). But the fever never left. She had a fever every day from March 21st onward, along with having a very “croupy” cough. I was told to expect the symptoms for about a week. On March 31st I called the pediatrician to let her know that her cough had improved but she still continued to have daily fevers– it was strange too, because the fever was every 24 hours, and she would always spike at night. Every day she would be cool earlier in the day, and I would think, “Today is the day no more fever,” and then that night around 1 a.m. she would wake up to nurse and boom–another fever! I brought her back to the pediatrician on the 31st of March and she was diagnosed with a right ear infection. It made sense to us, because of how bad her croup was presenting daily. She was placed on amoxicillin, but she continued with daily fevers despite the antibiotics. I called back on April 3rd to report the continued daily fevers, and she was switched to Augmentin. On April 4th she woke up at 7 a.m. with a 104ºF fever and did not look well. I took her back to the ER and she was admitted. Oivia was admittied to the hospital for six days for a “fever of unknown origin work-up.” They kept searching for another infection, thinking that maybe she was “just unlucky to get another infection because she is little, has a brother in day care, etc.” The Infectious Diseases specialist was consulted but every test was coming back negative for infection. They did talk about doing an whole body MRI as it was on the algorithm for “fever of unknown origin,” but then her urine test showed “CMV virus.” So we were told, “this was the reason for the fever–she just happened to get another virus.” With that we were discharged, again being told that it was “just a virus” and it had to run its course. We were still finishing up the Augmentin for the ear infection. We were discharged on April 9th. She was still having fevers, but her fevers were “going down” at that point. During this hospital stay her nursing pattern had changed–she would only nurse for a few minutes at a time and she would cry at times after pulling away from the breast. I was told that when babies don’t feel well, they will do shorter more frequent feedings then standard longer ones. Also, since I breastfed, her stools were always “loose,” so at that time I did not know that it was more loose than normal–she was actually having diarrhea. Who can say no to that face? On April 11th she developed another rash. This one looked like hives. She was on day 9 of 10 of the Augmentin, so I thought it would be strange to develop a rash like reaction so late in the antibiotic but when I called the pediatrician I was told to stop the Augumentin and that the hives for were likely from the antibiotic. The rash was gone by the following day on April 12th. During this same time on April 11th she continued to not want to nurse very long ,and she threw up a bottle twice. I also witnessed watery diarrhea happen when I was changing her. If I didn’t witness it, again I might have missed it since her stool is always loose. On April 13th she woke up very dehydrated and was brought to the ER. During the ER visit, she had a lot of diarrhea and ,she was admitted. Once again they were looking for a virus. Being told “she could of picked up a GI bug.” She also continued to have fevers EVERY day. The first week of her admission they were chasing an infectious cause. When nothing was coming up as an infectious cause, and she continued to have diarrhea with nursing issues, plus her abnormal lab values they starting consulting many, many, many specialists. We were told she could have JMML (juvenile myelomonocytic leukemia) or HLH (hemophagocytic lymphohistiocytosis) amongst many other scary diagnosis. What really led the doctors in a new direction was the whole body MRI (boy do I wish that was done the first time!) Her entire GI tract was inflamed. Also, the MRI noted inflammation in her fascia on all of her limbs, plus fluid in her elbow and knee joints. She also had a muscle biopsy that actually DID NOT confirm fasciitis- they think that she was third spacing fluid from her poor nutrition and it was the fluid that look like inflammation on the MRI. Elevated immunoglobulin E and M. Of note her immunoglobulin A and G were normal. Slightly enlarged liver with slightly elevated liver function tests. (Bilirubin was completely normal). Olivia has had some amazing doctors along the way. She now has a diagnosis and is on treatment. Doctors are now planning for her discharge from the hospital! Now that we have a diagnosis, we can start treatment. 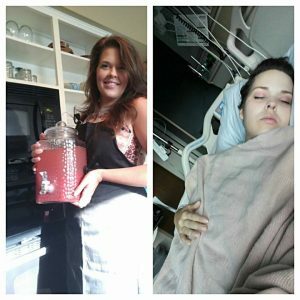 She was diagnosed with NLRC4-MAS! 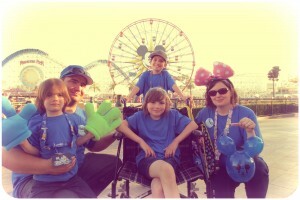 NLRC4-MAS is a genetic condition she was born with. 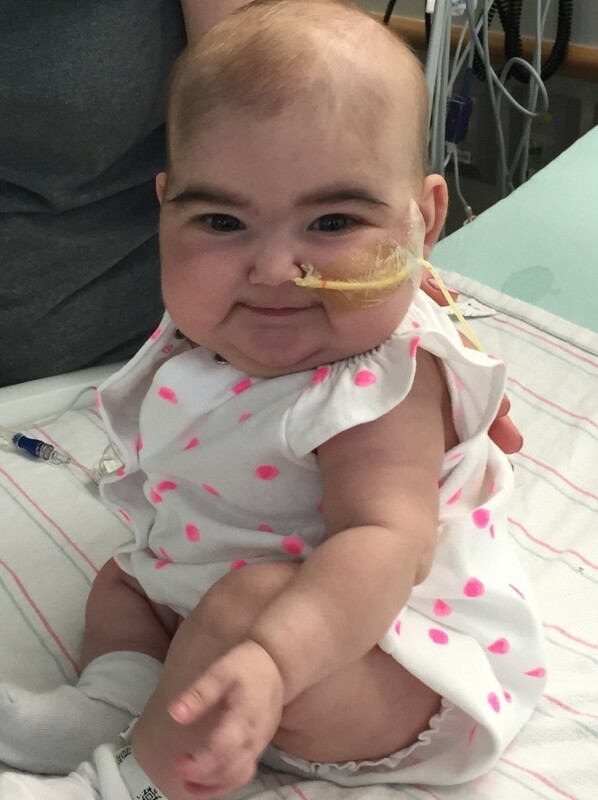 There are medications that have been helpful in other patients with NLRC4-MAS so we now have hope that Olivia will now get to live a healthy life. August 2015 Update: It’s been a bumpy road for Olivia since her mom sent us this post. But we are very happy to report that her treatment is working and they are planning to leave the hospital very soon! 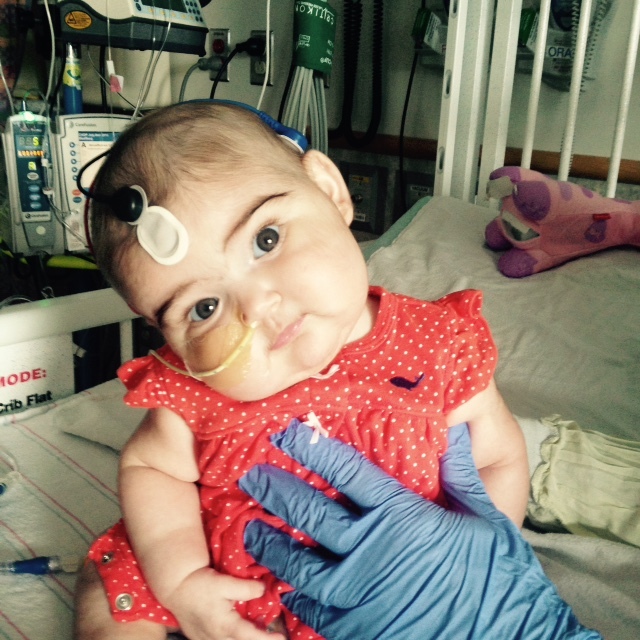 This is a huge cause for celebration as Olivia is now 6 months old and has spent most of her life in the hospital. We are so happy for Olivia and her family! Learn more about NLRC4-MAS here. 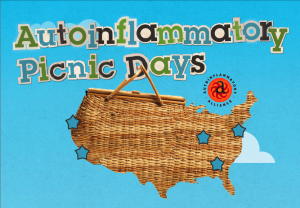 The Autoinflammatory Alliance is a nonprofit organization dedicated to helping those with autoinflammatory diseases. 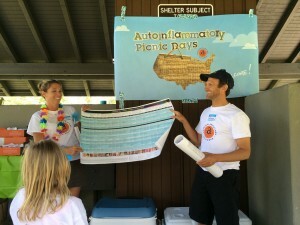 How "Hot" Are You for Autoinflammatory Disease Awareness & Research? Be a Rare Disease Day & Autoinflammatory Disease Advocate! Like Our Autoinflammatory Chart? You'll Love What's Coming Soon!